The day that Mary Ann Newcomber found about the SNOW Block Alley was indeed a lucky day for the project. Mary Ann has an enthusiasm that is contagious and let’s just say, she knows people. I’m sure I owe the front page coverage on the Idaho Statesman to her, she’s mentioned us several times on her Dirt Diva weekly radio spot on 94.9 The River and she’s talked about us on her blog. 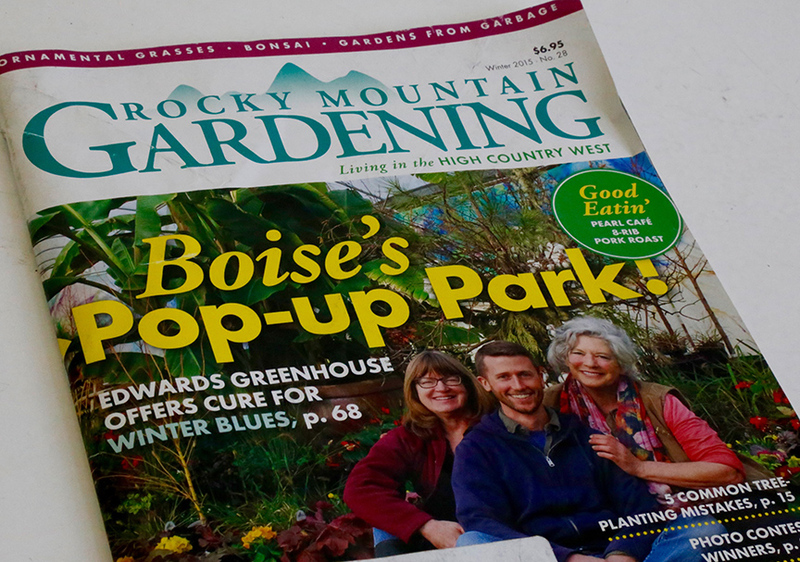 Now she’s written an article on the project for the winter edition of Rocky Mountain Gardening which you can read below. I’ve venture to say that Mary Ann knows everything about growing plants in this part of the world, and if she doesn’t, she’s friends with seemingly the who’s who of gardening in Boise…and beyond. And did I mention she’s a complete crack up to boot? I can hardly wait for spring because I can only imagine what I can learn and the fun I will have with this amazing woman. An artist by training, Linda could “see the potential” of turning the entire alley into a garden space. That morning, it was just a dirt alley full of trash cans and “stuff.” She had wild and big ideas: a place for families to gather, a place to grow a little food, a place for chickens. They could make beer, cheese, wine, and an orchard. They would transform the dusty alley into Eden! Ideas were sketched; spaces were measured vertically and horizontally. Devin–who happens to be exceptionally good at woodworking–came up with a way to build concrete corners for raised beds. They came up with a name: SNOW Alley. SNOW is short for “somewhere north of Washington,” and refers to Washington Elementary, one of the oldest public schools in Boise. 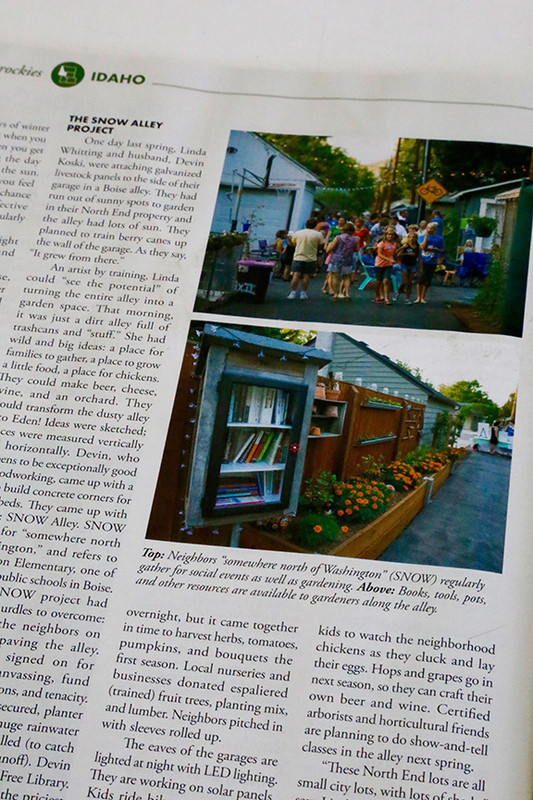 The SNOW project had two major hurdles to overcome: getting all the neighbors on board and paving the alley. Ten families signed on for cooperative canvasing, fund raising, connections, and tenacity. Donations were secured, planter boxes built, and huge rain water storage tanks installed (to catch and redirect roof runoff). Devin created a new Little Free Library. Paving the alley was the priciest part of the project at $5000. The local highway district donated the materials and the homeowners paid for the labor. A neighborhood grant of $500 was a start. It didn’t happen overnight, but it came together in time to harvest herbs, tomatoes, pumpkins and bouquets the first season. Local nurseries and businesses donated espaliered (trained) fruit trees, planting mix and lumber. Neighbors pitched in with sleeves rolled up. The eaves of the garages are lighted at night with LED lighting. They are working on solar panels. Kids ride bikes and trikes and scoot along until long after the sun goes down. Budding chalk artists work on the pavement as a canvas. A garage door becomes a movie screen for outdoor movie night complete with popcorn. A child height window allows the kids to watch the neighborhood chickens as they cluck and lay their eggs. Hops and grapes go in next season, so they can craft their own beer and wine. Certified arborists and horticultural friends are planning to do show and tell classes in the alley next spring. Anna Webb is the one who got you “above the fold” in the Idaho Statesman. She, too, is a fellow garden geek, and I just had to let her know about the Alley. And you know what they say, “Gardeners have the best dirt.” (Wicked grin). It’s so easy to get worked up over such a great undertaking. I tell friends and they tell friends and soon, we hope, more people will take charge of their available garden space. That’s certainly the dream! Thanks for all you do Mary Ann! Very nice article Mary Ann. Thank you for all the help and advice. Thank you Linda for this great partnership, we love being a part of it and having you write for us as well. Keep it up!